Offering Lyrical Dance Classes, Commercial Dance Classes and Disco Freestyle Dance Classes for all ages. 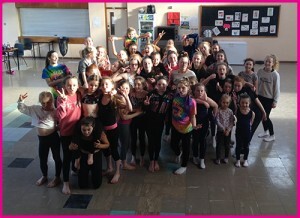 Dance AMAD is one of Dublins biggest Dance Schools. Dance AMAD has been running dance classes for kids in Raheny since 2000. Over the last 15 years Dance AMAD has seen hundreds of kids from Raheny dance through its doors. Dance AMADs dance classes in Raheny are held in the Della Salle School Hall, Raheny Road, Dublin 5. WE ARE TAKING NEW MEMBERS – SO COME ALONG & JOIN !!!! Dance AMAD operate a handy pay as you go system. This works out great for parents as there are no costly term fees & no worry that the child will drop out & leave you out of pocket. Our classes are only €5 per class & have been this price since we launched in 2000. Why not come along for a look, try a class out. We promise you will have fun learning to dance. Learn to dance in the Dance Moms style, with less of the Dance Moms drama. Dancing is a fun way of keeping fit, dancing is fantastic for kids confidence, coordination and general health. Contact Mairead Today for more info! Come along & join in the fun at our Dance Classes for kids in Raheny!